Now a familiar part of the scene at tourist sites in Munich, Falun Gong practitioners have held events over the past two years to reach out to tourists and residents alike to raise awareness of the ongoing persecution of the practice in China. The peaceful exercises of this traditional spiritual practice from China stand in sharp contrast to the brutality of the persecution that the Chinese Communist Party has waged on Falun Gong for more than 17 years. People from around the world and from all walks of life have shown strong support for Falun Gong and for bringing an end to the persecution. At an Information Day held on Tal Street on the first weekend of September, visitors from all over Europe signed a petition to condemn the brutal persecution in China. Many people were startled to learn about the state-sanctioned organ harvesting from Falun Gong in China. Some signed the petition with tears in their eyes. Canstani Neubart, a local physician, believes that there is a tremendous underground organ market in the world, but feels that most people do not want to face it. Falun Gong practitioners also provided materials in many languages for the large body of international tourists, most of whom signed the petition once they learned about what is happening in China. 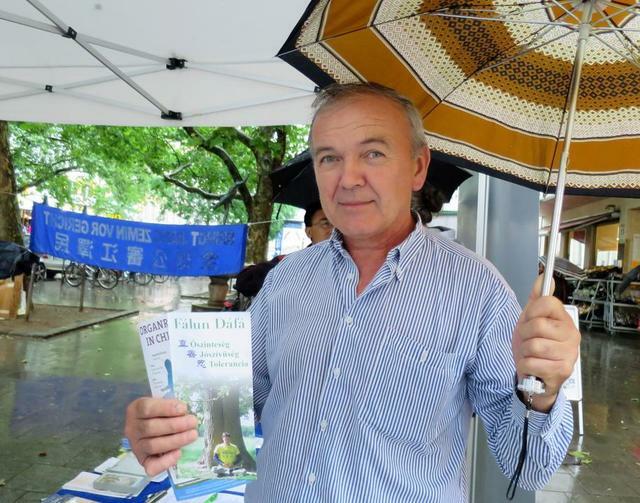 Földes Kalman, a retired Hungarian mayor said that he understands Falun Gong's situation, because his country was under the governing of the communist party too. Several young women from Hungaria also signed the petition after the mayor. Falun Gong practitioners make a special point to reach out to visitors from China, who have long been deceived by the communist party's propaganda. It is always an eye-opener for Chinese tourists to see a group so severely suppressed at home practised freely in Germany. Many Chinese people, especially young people, are willing to learn about what Falun Gong really is, why the communist party persecutes the practice, and they also want to hear about the details of the forced organ harvesting. Many of the Chinese tourists had their picture taken with Falun Gong practitioners. They accepted informational materials, and talked with practitioners at length. In fact, the Falun Gong exercises have become one of the Chinese tourists' “must see” tourist attractions when they travel overseas. One young woman from China couldn't believe that the government would harvest organs from living people. “I never heard of it in China,” she countered.